Pharma Marketing Blog: Are Doctors Avoiding Twitter Because of "Doctor Bashing"? Are Doctors Avoiding Twitter Because of "Doctor Bashing"? "Recently, I was told that some doctors avoid social media because of what they view as 'doctor bashing,'" said Kelly Young (@rawarrior), author of the Rheumatoid Arthritis Warrior site. In a post to The Orthopedic Posterous blog (here), Young cited a Twitter exchange during a recent #rheum (rheumatology topics) chat. She quoted one doctor who observed this Twitter interaction: "[I'm] a bit uncomfortable with content of these tweets. Doc bashing online puts docs off communicating with patients via this medium." 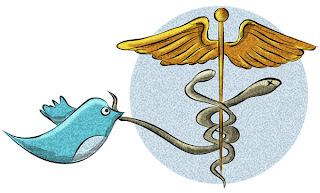 I am not sure how many doctors use Twitter to communicate with patients. But if they are hesitant to do so, they have many other reasons than online "doctor bashing," which isn't really new. "Doctor bashing" was here already, long ago, on online patient bulletin boards and listservs that are "old school" types of social media. So what are some of the concerns that doctors have about communicating with patients via today's (Web 2.0) social media tools such as Twitter? How are physicians and patients currently using Social Media? What are expectations and limits? What are Best Practices? As it so happens, those questions will be addressed at the Doctors 2.0 & You conference in Paris this June (see the agenda here). Denise Silber (@Health20Paris) is the conference organizer. Denise and I have set up an "old school" discussion board on Pharma Marketing Network (here) where you can contribute to the discussion about doctor bashing and other issues that will be covered at the conference. Also, you can follow the #doctors20 hash tag via Twitter (especially if you are a doctor! Don't worry, there will be no "doctor bashing" by us!). P.S. Here's a doctor that should have been "bashed" online, but wasn't. Posted by @nalts on Twitter: "Who knew what the now-arraigned PA abortion doctor did? Umm. The internet? (vitals.com) http://bit.ly/FreezeYourBaby #fdasm"
I do think physicians have valid concerns about "doctor bashing" - but then we all have those concerns (there is, for instance, such a thing as "anybody bashing"). It's one of the things we try to do over on MDchat - MDchat to help them feel more comfortable with these real-time media. But, I've been seeing a tren of more physicians getting more comfortable - just in the last 6-12 months actually. Perhaps mobile (iPad, iPhone) is helping in that regard. But there is doctor-bashing that happens (quite often) - and it doesn't help the cause a whole lot. Complaining about specific problems is one thing, but outright discourteous behavior is another. But that's always been the case on the Web. That's the big problem about Doctors. They must use Social networks like Twitter in order to reach by clients their informations. But if they don't want to experience "Doctor Bashing", better not to try Twitter. Social networking is the most sought after medium for communication these days, Doctors will be left behind if they don't use this medium effectively. I do not think so. Most of the doctors are using Twitter because by doing this they can share their ideas and experience.